I love old movies. I grew up with them. 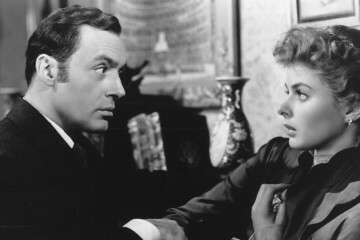 My mother mainlined TCM (Turner Classic Movies), and my father had cabinets full of VHS tapes that I wore out. I started to realize later on that not everyone could quote Arsenic and Old Lace (1944) by heart, or knew every musical Bing Crosby had ever done. I eagerly share my favorites with whoever will listen… and now you’re listening. I plan to do two things for each article in Talking Classics. The first is to tell you about old movies and TV shows (until about the 1970s or so), because I want everyone to watch them. Second, I want to talk about what I experienced watching them with modern sensibility. A lot of these films are blatantly sexist and racist, and a lot of them are oddly ahead of their time. I’m always interested in how movies age, and how they reveal some of our own issues. My first pick is His Girl Friday, which premiered on January 11, 1940. Directed by Howard Hawks and starring Carey Grant and Rosalind Russell, this quick-fire screwball comedy was adapted from a 1928 stage play called The Front Page… with one small change. The role of the embattled reporter trying to get away from the newspaper business to get married, traditionally played by a man, is now played by a woman. The movie begins with former reporter Hildy Johnson (Rosalind Russell) telling her former editor and ex-husband Walter Burns (Carey Grant) that she’s getting married. 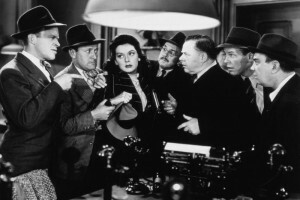 The plot revolves around Hildy trying to leave town with her affable fiance Bruce (Ralph Bellamy), and Walter trying to win her back both as a reporter and as a spouse. The background plot involves the imminent execution of Earl Williams (John Qualen), who was convicted of murdering a police officer, but we quickly realize that the mayor (Clarence Kolb) and sheriff (Gene Lockhart) is using his execution to secure their re-election. I won’t spoil the plot, but as what usually happens in screwball comedies, hijinks ensues. One of the first things you’ll notice about this movie is the quick-fire dialogue and the Robert Altman-esque crosstalk. 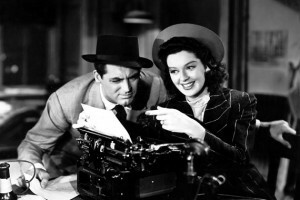 Hildy, Walter, and the pool of city reporters snark at each other in rapid succession, creating a sort of world of fast-talking, hard-living newspaper life. Hildy and Walter reminisce about throwing themselves into danger and even forgoing their honeymoon, all in the name of a story. Hildy’s fiance struggles to keep up, always talking slower, always getting duped, while his eminently respectable mother recoils in horror with this world that Hildy is still half in love with. As Hildy struggles to leave reporting behind, we can’t help but want her to stay, as she’s obviously the best out of all of them. In video games, the female version of Mass Effect’s Commander Sheperd (or fem-Shep) is one of the best-written female characters because the dialogue, characterization, and storyline is the same as the male version. The same can be said for Hildy Johnson. 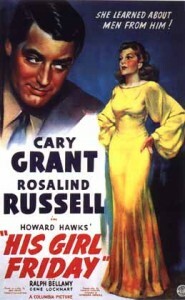 The film adds a romantic subplot between Hildy and her editor, and some dialogue is inserted about her wish to be a wife and mother (or, as she phrases it, a “human being”), but much of the story still revolves around her skill and ambition, just as it did for the male version (who also wanted a domestic life). Her colleagues all regard her with respect; she’s not asked to get the coffee or take notes. Think of Hildy as a Lois Lane without Superman. She’s chasing down leads, to the point of literally chasing and tackling them in the street with gunfire all around her. At the same time, she’s the only one who seems to have a moral center, treating the downtrodden with a kind of humanity that’s just not present in the other reporters. At the same time, there are some gender things in this film that don’t quite work. Walter’s scheming and manipulation, all the while proclaiming his love for her, feels almost stalker-ish. Carey Grant is charming because he can’t not be charming, but his mind games make me want Hildy to stay in newspapers… but FAR away from him. A lot of credit can be given to Rosalind Russell: not only does she play her character as the smartest person in the room, but according to her autobiography she hired a writer to compensate for her underwritten part, and then snuck in the new lines as ad lib. I wonder if the line, “You’re wonderful in a loathsome sort of way,” is hers. 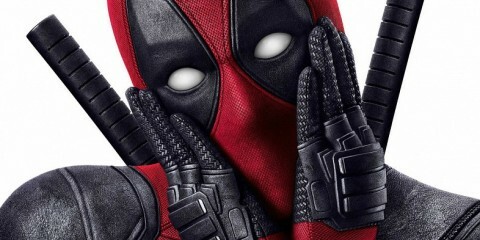 We can see hints of what the movie might have been in the movie poster, which is hilariously awful. Carey Grant leers at Rosalind Russell, who poses in an evening gown… that she never wears. She spends the entire movie in career attire. The poster’s tagline is, “She learned about men from him!” Despite being a super weird tagline, it focuses the whole film on the romantic subplot, and it implies… what? That she needs to be saved from creepy Walter? That she’s a better woman for being with this unconventional rogue? I have no idea, but I’m so glad this is a much better movie than that poster implies. A few notes of weirdness in the background. First, the real issue with the execution in the background (remember that?) is that the convicted man shot a “colored” (re: black) cop, and the mayor is using the execution to secure the black vote for his re-election. Given the current issues in the US about race and police brutality, this whole plot point will sound really odd. Likewise, the characters’ flippant discussions of Hitler, the “European War,” and communism give us a hint at the the very real fears of the time. We also get to see when newspapers were the primary source of the news. I wonder how a remake of this would play out in a modern retelling, with a 24-hour news network or news bloggers. The ending is also just awful, with Hildy finally breaking into tears and sort of accepting Walter’s plans for her. That’s okay. Once you really dive into classic comedies, you’ll start to see that every ending is terrible. Watch it for the movie itself, which is sublime. For each of these movies, rather than rate them, I’m going to just give a distilled recommendation. If you’ve ever spent time on a newspaper or writing for a publication, you’ll love the journalistic humor that is in some ways timeless (Walter exclaiming, “Who reads the second paragraph?!”). Otherwise, just enjoy it for the dialogue, Carey Grant is always wonderful in a comedy even when he’s playing a creep, and Rosalind Russell is the queen.